I realized something the other day when I was doing some painting. Not that the painting is the important part here, my mind was wandering. I had an epiphany. I don't mind if a player deviates from their Codex, but I do mind when I player deviates from the game rules. How does that make sense? It dawned on me that I don't mind playing against opponents who make changes to their Codex/army list, but I do mind when people try to change the rules of the game. And by the rules of the game, I mean the ones we use for shooting, movement, hand to hand combat, etc. How nice of me huh? It's the least I can do right? To let a player adjust their army list and say I don't mind what you use in your army, but turn around and say I want to play by the rules for our game. That's not confusing or a bit of a double standard at all is it? You see, I really don't think it matters in the end what you equip your troops with or whether or not this or that counts as a "Troop" choice. I mean just look at the Space Marine codex, just about anything can be a Troop choice if you pay the points (get the character, jump through the right hoop) to do it. And if you can't do it with the vanilla codex, you can do it "counts as" with one of the other ones out there. Now I'm not saying this is an excuse to go all out and give your whole squad meltaguns. I would expect some degree of restraint be exercised. But if you wanted to give your special weapon trooper a plasma gun instead of a meltagun even though it's not an option in your codex, who cares? Go ahead I say, have at it. Want to use Forge World rules and models, go ahead, fine with me. Even the experimental ones they put out. Want to use the better Storm Shield rules for your terminators, why not? But like I said, I think it requires a bit of self restraint. I like to use the cool stuff and have all the neat options, but it can quickly get out of hand. How do you know when enough is enough, maybe when you have to ask yourself if this "change" is too much, you've gone a bit too far. Time to come back. Now fan made stuff is whole new story. I don't see much of that around me, so I can't comment on that aspect. I would say that if someone came to the table with something that looked like they put some real effort into it and it appeared to be both balanced and generally in line with the 40k universe as we know it, I wouldn't have any trouble giving it a go either. You see I don't mind if you change your army around, just don't mess with the rules. It's a good view to have. I'm not sure I'd be as open to codex tweaks, but I'd look at it this way: We play with tweaked codexes all the time - Eldar, so far for the life of 5th ed, have run on 4th edition rules. What changes, really, when the 5th ed codex comes out? Tyranids got a big change, no longer being able to mutate their whole army, which was a really cool ability. Lets look at a more practical example - Black Templars, Dark Angels, Grey Knights, Demon Hunters, even Dark Eldar up until last month - all running on old codexes. 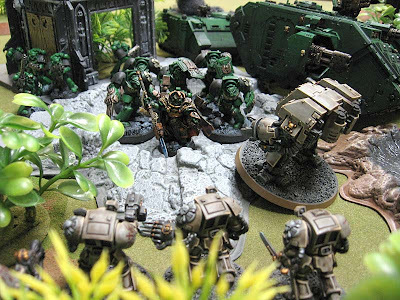 Nothing stops Dark Angels from running from a new codex and just painting their armour green, but GW allows the old stuff to be used. These are all rules of how armies work though. We still need an even ground for how the game runs. Codexes are an ever changing thing, but without a balanced game to bring those army lists to, then what are we really doing? If GW has done their job correctly then the base rules are really all that matters. I think the current version of the rules are really well done and there is not need to change them. As for the army list, I say do wat you want. Have you ever played non-point matched games? or games with no army comp? How about a game against a really old codex? Drunken Samurai: I too like the current rules. I've tried playing a number of different ways. As I get older, I find myself open to more ideas and different ways of playing instead of just the same thing each time. If you want to switch out a weapon for "normal" costs or use an updated entry for a unit (a Dark Angel hybrid using Vanilla, Space Wolves, and Blood Angels bits without getting carried away) or an updated rule (Storm Shields for instance) go ahead in a friendly game. I think my feelings about fandexes explains the whole thing quite well. If you create a fandex to express your army of choice, I am fine with it, I even invite it. I will treat our games as play testing and enjoy them as such. But if you create a fandex to *win* I do not see the point. I can give my Imperial Fists Feel no Pain, Stubborn, 2+ inv saves, and half cost for all weapons. I can justify it with fluff. But while it would make my army *better* for winning, would it make it more fun? Hardly. I think you're right - I mean, using old Codexes, in my opinion, is fine - as long as you use the whole of that ONE CODEX. I think it'd be a bit unfair if you said that you wanted to use THAT rule out of the older Codex, THAT rule out of the new one, THAT points cost for that Marine, etc. What I wondered though was what game rules you were talking about people changing? 'I don't care if it's AP1, my Tactical Marine is still having his 3+ save...', that kind of thing? The only time rules changes should be acceptable (and I'm willing to be very flexible with them), is if both players agree to them BEFORE the game starts. I just think people should not take offence if their opponent asks to play by the official rules. I agree wholeheartedly with Flekkzo's views. In the end almost anything is Kosher as long as the game is fun. Flekkzo: Absolutely, it must be fun. One of the troubles is when people will sometimes use "fluff" to justify the win combo. Darren: I wasn't referencing any particular game rule. It just struck me as odd that I have no problem with codex alterations but want to play using the rules without changing them. Why one without the other? I can kind of see where the allowing (and love) of one change can be completely contradicted with hatred of the other. It is fine if someone changes their Codex around a bit, there are plenty of armies out there and as long as it is fair, it is no different than facing an army you haven't gone against in a while. There are dozens of possibly army lists out there, but there is only one main rule book. Shooting happens after movement, but before assaulting, etc. If your opponent plays a customized army, chances are it is affecting how he plays and how he has fun, not you as much. You change rules and they are global. Suddenly, both you and your opponent are playing a new game, not just your opponent. And to be honest, the game we are playing right now is fine. I'll play against anything so long as I'm aware what does what. Its the times that a guy gets out of a transport and your opponent says; 'Oh yeah, he's got a 2+ inv, 10 attacks and a triple-linked death melta pistol' that annoy me. What I would say is that you can change any rule you fancy so long as all involved agree. There can be perfectly good reasons to change a rule not least of which is to see why the rule is written the way it is. 40K is a rules sytem designed for fun, if you find it more fun by changing something what's the harm. To look at it from a strict point of view this idea that the codexes should be more flexible is silly. To take it to an extreme since codexes over-rule the main rules you could just modify a character to have a rule which over-rides the main rulebook. What matters for fairness and fun is not which rule you change, but how. Mini: That's a big apart of it too, making sure your opponent knows what he's up against.